If you need pull handles for you doors, whether you want them single sided or back to back pull handles, there are many simple, functional styles available. 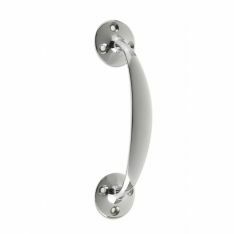 These may fit an environment where the sleek lines of modernism enhance the atmosphere, but perhaps you want something more elegant and old world than a straight or curved length of stainless steel, and we offer a broad selection of cranked handles for sale. If you want to buy cranked handles, you have a choice of beautiful designs in metals including brass, chrome and pewter. The designs themselves range from the 152mm Polished Chrome Victorian Bow Handle to the Polished Brass Pub Style Pull Handle, which comes in sizes ranging from 150mm to 300mm. Many of these designs evoke a bygone era, whether it’s the 153mm Polished Brass Bow Handle or the From the Anvil Pewter Gothic D Handle, which is available in 6” and 8” sizes. On the other hand, you may be looking for something simpler, though still elegant, such as the 225mm length Polished Brass Oval Grip Pull Handle. Despite their elaborate designs, all these face fix and cranked handles are straightforward to fit, and many come with matching screws provided. Besides face fix and cranked handles, we have a comprehensive range of pull handles and plates for sale, including pull handles on rose, pull handles on plate, bolt through pull handles, cabinet and kitchen handles, flush pulls, kicking plates and push plates.